There was some good news last week when new figures from the BTO Garden BirdWatch survey revealed that the decline in house sparrow numbers appears to have levelled off. Populations of house sparrows across the UK have fallen from about 12 million pairs in the 1970s to between 6 and 7 million pairs today, with a greater reduction in urban and rural areas than in suburban ones. But the latest data from the British Trust for Ornithology’s (BTO) Garden BirdWatch, a citizen science survey in which birdwatchers and householders monitor gardens across the country throughout the year, suggests that the decline in gardens has stabilised since 2009. Figures from the trust show that in 1995, the proportion of gardens reporting one or more house sparrows was about 80%. This fell steadily to 60% in 2009, and has remained at the same rate since. “It’s too soon to say that they are increasing but the decline has definitely levelled off since 2009 and hopefully this means they’ll start to increase again,” said Clare Simm, BTO’s Garden BirdWatch development officer. The house sparrow is a “red-listed”conservation species which has been in long-term decline, particularly in urban environments. Its populations across Britain have been hit by a loss of nesting sites and food sources, especially insects to feed their young. 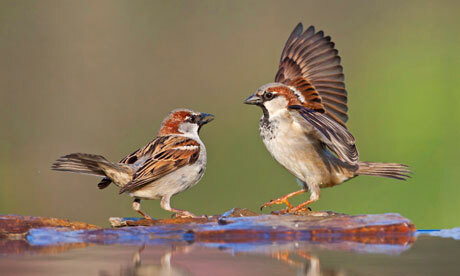 In rural areas, changes in farming practices are thought to have affected house sparrows. But in urban and suburban areas the causes have been more complex, with everything from cats to air pollution and pesticides being blamed. • Let an area of your garden go wild to encourage insects. • Plants like hawthorn and ivy provide thick vegetation for sparrows to hide in. • Provide them with a home, using either a house sparrow terrace or nest boxes near the eaves of your property. • Feed them with a suitable seed mix that includes large grains. • Regularly clean your feeding stations to prevent disease. This entry was posted in Birds, Nature, Wildlife and tagged Big Garden Birdwatch, bird, birds, birdwatching, British Trust for Ornithology, conservation, countryside. Bookmark the permalink. Most of them have come to live in our garden about 50 miles north of London – where they are very welcome. One particularly enterprising one collects the insects trapped under the glass-roofed back porch. Very uplifting to learn some good news about the environment. Thanks for keeping the world posted!